Yes, Even You Can Use Google Analytics! team, we know that many non-profits would love to know how users are interacting with their websites: which sites they are coming from, which pages they are leaving, where the users are located geographically, and more. Google Analytics offers you the ability to access this information for free. Yet many grantees and other non-profit organizations often feel intimidated or overwhelmed, thinking they don't have the resources to implement an analytics program. Today we're happy to share several resources (beyond the main Analytics site and Help Center) that can help even our non-techies use Google Analytics effectively. The Google Analytics Product Tour offers a great overview of this free tracking tool. Take a look for a quick overview of Analytics. The Setup Checklist is a perfect one-stop shop to use when configuring your account. The Google Grants Help Center contains the 'Analytics Guide' and the 'Scheduled Reports Guide' for Analytics. Both are located on the right-side of the page. The Google Analytics Blog shares valuable posts for those new to Analytics. For example, yesterday's post discussed basic tools like the URL Builder and SiteScan. In addition, there are Google-authorized agencies that can assist you with Google Analytics, many of which offer free services for select non-profits. For example, MoreVisibility is an authorized Analytics consultant who works with non-profits. Find out more on the Google Analytics site. We hope these resources empower you to set-up Analytics and start seeing how users interact with your site today. Happy tracking! On the Google Grants team, we know that many non-profits would love to know how users are interacting with their websites: which sites they are coming from, which pages they are leaving, where the users are located geographically, and more. Google Analytics offers you the ability to access this information for free. Yet many grantees and other non-profit organizations often feel intimidated or overwhelmed, thinking they don't have the resources to implement an analytics program. Today we're happy to share several resources (beyond the main Analytics site and Help Center) that can help even our non-techies use Google Analytics effectively. Since I started working with Google a little over a year ago, one of my primary responsibilities, aside from my work with the AdWords program, is to orchestrate Google Grant events in our Boston office. In this role, I've been able to help individuals in our office review and build out advertising accounts for hundreds of non-profit grantees. One thing that the volunteers and I often don't get to see when working on accounts at our desks is the direct impact that this advertising can have and what it means to the non-profits that receive extra advertising flexibility in their monthly budgets. Instead, the huge impact that companies like Google, volunteers, and I can make in the daily workings of organizations and the millions of individuals that they serve are reiterated and driven home through the chance en route interactions I mentioned before. At the end of the day, participating in Google Grants isn't just about selecting keywords or writing ad text; instead, it's about forging partnerships that connect people with the organizations and help they need - be they in your neighborhood or an airplane ride away. I suppose this goes to show that the next time you travel, you never know what doors a conversation with the person next to you might open or the journeys on which you might embark.
" (SEO), or how to earn a spot for your content that is closer to the top of Google's natural (left-hand side) search results. It was a rewarding experience because we were able to take what's often a technical conversation and make it feel like something everyone could (and should) do. Indeed, when most people hear the words "search engine optimization," they figure it's too technical for them or that it doesn't apply to them. But if you're running a long-term education or awareness campaign, you need to know how to improve the chances that interested users will find your information through natural search results. It's just as important as learning how to use your Google Grant effectively. Fortunately, much of what you can accomplish with SEO doesn't require any programming or technical skills, but it does require a big-picture awareness of your issue. Because ultimately, you're not trying to rise to the top of any one search results page, but rather to make your site more relevant to the whole search picture, which means designing your site, sections, and sub-pages with the most high-demand search terms related to your issue in mind. Doing well in high-demand search results pages requires that you first know what search terms or keywords are most popular. Take concepts and terms you discuss on your site and test them against related terms using tools like Google's Keyword Tool and Insights for Search. Make sure you're developing individual pages centered around what people are looking for, using the language they use. Use these high-demand keywords where they accurately describe your content, especially in page titles, section headings, and in URLs. If you have lots of images or interactive graphics, make sure your most important content appears in text too, because the Googlebot doesn't read images. Finally, understand that the number and quality of other sites that link to your content determines much of your ranking in search results. Make sure you know the other online players on your issue, and encourage them to link to you. Starting a blog or Twitter feed is a great way to keep users abreast of the latest updates to your site and encourages them to link to you too. If you're interested in learning more, check out the slides from the recent training below, watch some helpful videos from Google's SEO expert, Matt Cutts, or feel free to dive into our full Search Engine Optimization guide. There's a lot to learn, but keeping in mind the fundamentals will help you go a long way toward improving your ranking. At a recent non-profit training held in our D.C. office, I got the chance to teach a group of issue campaign managers the basics of "search engine optimization" (SEO), or how to earn a spot for your content that is closer to the top of Google's natural (left-hand side) search results. It was a rewarding experience because we were able to take what's often a technical conversation and make it feel like something everyone could (and should) do. NTEN, the Nonprofit Technology Network. This last webinar, titled "Optimizing your Google Grants Campaign and Maximizing Your Online Initiatives with Google Nonprofit Offerings," is part of the advanced track designed for current grantees who are interested in learning about more in-depth ways to maximize their Google Grant. This session, which will be held from 11am PDT until 12:30pm PDT, will focus on various tools that can help you evaluate and improve your AdWords campaigns, as well as your site overall. We'll also provide an overview of several other Google tools that can be quite valuable to non-profits in their work, including the YouTube Non-Profit Program, Google Earth Outreach, Google Apps, and more. If you're interested in attending this webinar, you can find more information and sign up on NTEN's site. We hope you can join us! As many of you know, this Friday, June 26, will be the finale in our Google Grants webinar series with NTEN, the Nonprofit Technology Network. This last webinar, titled "Optimizing your Google Grants Campaign and Maximizing Your Online Initiatives with Google Nonprofit Offerings," is part of the advanced track designed for current grantees who are interested in learning about more in-depth ways to maximize their Google Grant. This session, which will be held from 11am PDT until 12:30pm PDT, will focus on various tools that can help you evaluate and improve your AdWords campaigns, as well as your site overall. We'll also provide an overview of several other Google tools that can be quite valuable to non-profits in their work, including the YouTube Non-Profit Program, Google Earth Outreach, Google Apps, and more. Google Grants Workshop, please sign-up to enter our invite lottery by June 30th. To take full advantage of this event, we ask for attendance from the primary AdWords account manager and up to one additional representative per organization. Also, to help us better understand how we can help your non-profit, we'll ask you for some basic information and a brief statement about why your organization would benefit from attending this event. We'll be following up after the June 30th deadline with the results of the lottery. We're looking forward to August! The Google Grants team wholeheartedly believes in grantee empowerment. We're focused on providing as many resources as possible to help you, our grantees, become better Google Grants account managers. We also want to keep you informed of other Google products and services that may be beneficial to your non-profit. That's why we're thrilled to announce that we will be hosting our first grantee conference this summer. Aptly named the Google Grants Workshop, this event will be held in early August at Google headquarters in Mountain View, CA. During the event, grantees will have an opportunity to learn tips and tricks from successful grantees, attend AdWords seminars taught by in-house experts, and learn how to maximize Google for Non-Profits products. Our goal is to provide content for a diverse mix of attendees with different interest areas, locales, sizes, and levels of AdWords experience. In the typical Google spirit of making information accessible and useful, we will record this event and post the videos online after. So, even if you aren't able to attend, you won't miss a thing. While we'd like to open this event to all our grantees, we have a limited number of invitations and may not be able to accommodate everyone. Therefore, we'll be holding a lottery drawing to ensure that we issue invitations fairly. If you're an existing Google Grants recipient and are interested in attending our Google Grants Workshop, please sign-up to enter our invite lottery by June 30th. To take full advantage of this event, we ask for attendance from the primary AdWords account manager and up to one additional representative per organization. Also, to help us better understand how we can help your non-profit, we'll ask you for some basic information and a brief statement about why your organization would benefit from attending this event. We'll be following up after the June 30th deadline with the results of the lottery. can help you determine how high search volume is for your cause. That being said, we recognize that many grantees would like to spend more of their budget to effectively reach interested individuals and promote more awareness of the causes they support. Therefore, we'd like to introduce you to a tool that will help you do just that: the Search-based Keyword Tool (SbKT). This tool reviews the content of your website and generates a list of relevant, historical Google search queries on which you're not currently advertising. In other words, the SbKT provides you with relevant keywords that you previously didn't even know were untapped marketing opportunities. Including some of these terms in your account can help you spend more of your marketing budget, and also connect you with additional targeted users based on what you know they're searching on, rather than what you're guessing they're searching on. To use the tool, type www.google.com/sktool in your browser and sign into your AdWords account. Once you've done so, simply enter your URL into website field and let the tool do the work. It'll even display landing pages that might be relevant on your site and provide bidding suggestions for each of the terms it provides. Once a list of new keyword suggestions has been generated, you can pick the most relevant terms, export them to a CSV, and upload them to your account. For more detailed guidance on how to use the SbKT, please visit our help center. We hope you enjoy using the Search-based Keyword Tool to further build out your account! As a Google Grants recipient, you have $10,000 per month in AdWords spend at your disposal. This is a very exciting, though sometimes daunting, opportunity. We often hear questions from grantees who are interested in spending more of the monthly budget they've been awarded. Indeed, most grantees' accounts spend less than the monthly allowance, which is understandable given that most non-profits in the U.S. and in the Google Grants program, are small, local organizations that that primarily serve their immediate areas. Typically, many of the non-profit groups who spend their allotted budget, or come close to it, are national or international organizations that work on issues that are searched on often. Google Insights for Search can help you determine how high search volume is for your cause. That being said, we recognize that many grantees would like to spend more of their budget to effectively reach interested individuals and promote more awareness of the causes they support. Therefore, we'd like to introduce you to a tool that will help you do just that: the Search-based Keyword Tool (SbKT). program based on its large student population. These two college towns with Google offices both have the unique advantage of accessibility to a wide range of universities with students and professors who are interested in online advertising for non-profits. "Because Boston has so many colleges and so many non-profits, we thought it would make sense to expand the program here as well," said AdWords in the Curriculum organizer Laura Odorczyk. "At the end of last year, we officially launched the AdWords in the Curriculum team in Boston and started reaching out to schools." Emerson University was the first school to participate in Boston's AdWords in the Curriculum program. During the spring semester, Emerson students worked with six local non-profits on their Google Grants accounts. These non-profits included The Level Field Foundation, Samaritans, Farm Aid, VHL Family Alliance, Partners for Youth with Disabilities, and Piers Park Sailing Center. Undergraduates in the Emerson class titled 'Social Media and Marketing' learned about both online advertising and social media in the context of integrated marketing and communication outreach. During the spring semester, the innovative course was featured on Social Times and XConomy. More details to come on the students' work with grantees in future blog posts. Stay tuned! AdWords in the Curriculum has arrived in Boston! After Ann Arbor, Boston was the next logical location for an AdWords in the Curriculum program based on its large student population. These two college towns with Google offices both have the unique advantage of accessibility to a wide range of universities with students and professors who are interested in online advertising for non-profits. If you're looking to improve document collaboration within your organization, read 'A Few Good Tools for Sharing Files with Distributed Groups' from TechSoup. Check out the 2008 IT & Staffing Report from the Nonprofit Technology Network and the NonProfit Times for a look at the current state of nonprofit IT staffing and how to bargain for more resources within your organization. If you're based in the Bay Area, consider attending the Craigslist Foundation Bootcamp June 20th in Berkeley, CA for a gathering of those in the local nonprofit community. The monthly resource round-up for June includes an article about document sharing within your team, a report analyzing nonprofit IT and staff, and a look at an upcoming Bay Area nonprofit gathering. With that end in mind, we held a small, educational event on May 7th in our Tel Aviv office to share with our program participants the many ways non-profit organizations and charities can benefit from Google's products. Meir Brand, Google Israel's Country Director, kicked off the event with an overview of recent trends in the online world with an emphasis on Israel. Participants then learned how to manage and maximize an AdWords account and received a sneak peak into the intriguing world of YouTube, user generated content, and how video can serve as a powerful and engaging tool to convey an organization's message. After a short break, the non-profits also learned about the importance of a good UI and friendly website design, and saw how an entire organization can share information and ideas more easily using Google Apps, our cloud computing solution. Folks also had the unique opportunity to mingle with both Googlers who volunteer in the Google Grants program and fellow non-profits who could share their best practices and marketing experiences. Time and time again, my belief that working on Google Grants is a great way to do good in a community that often needs some guidance about how to get online. Together, we can really make a difference. I joined Google's sales team close to three and half years ago, just as we were beginning our operations in Israel. Shortly after joining, I came to learn about the Google Grants program. With joint effort and support from the local and global teams, we finally launched this program in Israel in November 2008. We now have close to 40 non-profit organizations in Israel participating in the program. Volunteering for Google Grants is incredibly gratifying, as we get to do what we know best: online advertising. For the local team in Israel, helping non-profit organizations attract new volunteers, increase donations, serve more clients, and spread their messages is truly one of the greatest rewards. We're a few months into the program, and have realized that organizations benefit most from a Google Grant when they understand how to use it to best meet their goals. Just being approved for a Google Grant isn’t enough. By taking the time to learn about AdWords and get involved in the account management process, an organization can really maximize its advertising grant. The AdWords Billing Tab: What does it mean for Grantees? This is a common question we receive from grantees since seeing costs and an account balance in your AdWords account can be confusing. As such, I thought I would take a moment to clarify how Grantees should view the Billing tab in their AdWords accounts. First and foremost, Google Grants recipients are not charged for their AdWords accounts and will never accrue an outstanding balance. Because Google Grants advertisers share the same interface as paying AdWords advertisers, you will see certain features and options that do not pertain to Google Grants accounts (i.e. the Billing tab). 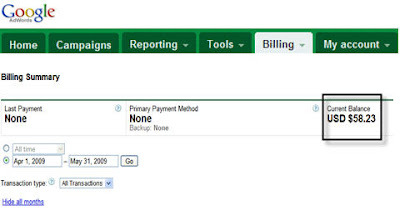 Clicking on the Billing tab in your AdWords account takes you to the Billing Summary page. This page aggregates billing information for our paying advertisers, listing the following billing categories: Last Payment, Primary Payment Method, and Current Balance. For a Grantee account, the Last Payment and Primary Payment method will be set to 'None'. The Current Balance is a running total of the amount your account has accrued in free advertising. Again, for Grantees, this is not an amount owed or a balance due. Want to know the in-kind value of your Grants account over a given period of time? You can view the Current Balance on the Billing Summary page as the amount your online advertising on Google.com would have cost if you were not receiving free ads through your Google Grant. Therefore, you can look at this amount as monetary value of your Google Grants award. "I thought the Grants program was free AdWords advertising. Why does my account say I have balance??"